Regular long-time readers of Bondings 2.0 may remember our posts about Sister “Monica,” a U.S. nun who pioneered ministry to transgender people. We’ve covered her involvement in this groundbreaking work a few times (here and here, for example), and you can read about her ministry and why she chooses to remain anonymous, using only the pseudonym Sister “Monica” when she appears in the media. Sister Monica, third from right, with her group of trans women in Argentina. In another part of the world, another Sister Mónica has emerged who is doing similar outreach work with the transgender community. This Sister Mónica (which is her real name) lives in the Neuquén province of Argentina and is a member of the Discaled Carmelite Order, a contemplative community. Her ministry has even attracted the attention and support of Pope Francis. Her story first appeared in OhLaLá, an Argentinian web magazine for women. 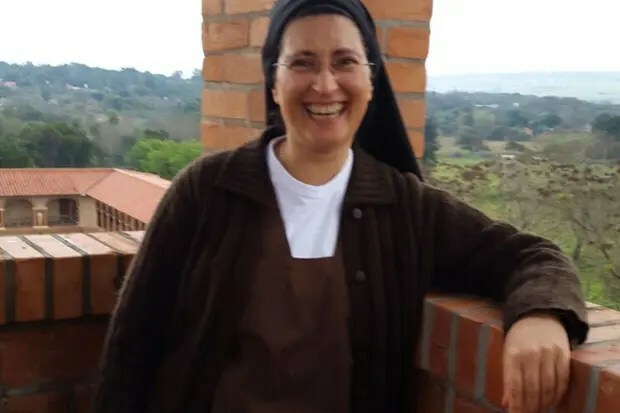 Thanks to “Rebel Girl,” the blogging name of a contributor to Iglesia Descalza, a site for progressive Catholic reflection, we have an English translation of the article featuring Sister Mónica Astorga Cremona. ” ‘I feel that God wants me to accompany the wounded and that’s why I take responsibility. They often tell me I stand with them; it’s that I feel that from that place I can understand them. Because when we look at them from the other side, it’s impossible. I get in deep,’ the sister adds. “And because of this kind of attitude, it’s not surprising that in December 2005, when Romina, a trans woman, approached Lourdes parish, the bishop decided this was a job for her. ” ‘The first time I came to see the group of trans women, I asked them to tell me their dreams. One of them, Kathy, told me that hers was to have a clean bed on which to die,’ says Mónica. At that time the nun contacted a priest, told him about the case and got an abandoned house which eventually became the refuge of the girls, as Mónica calls them. “The girls make a huge effort against the stream. We have to help them and integrate them. They are capable and intelligent people, but they are abused. We ourselves are the ones who lead them to the streets. If society would open the door to them and give them a chance, we could help them get out of this. . . . The witness of Sister Mónica should challenge all of us to take one more step along the journey of advocating and standing in solidarity with trans people. It is people like her who are building God’s reign of justice and peace in the world and in our Church. Wonderful! So wish there were more like Sister Mónica! I send her my gratitude, love & blessings. I am a heterosexual Orthodox bishop, who openly and strongly supports LGBT persons. beautifull and uplifting witness to Jesus in our times. I have a godson who is trans woman now. may our church follow the example of sr monica! and pope francis!! go monica!!! It makes me so happy to read of dedicated Christians serving the needs of those we have traditionally ignored. Thanks to Sr. Monica, thanks to Pope Francis, and thanks to you Frank DeBernardo. Great Reporting of a Great Work. Thanks for all you are doing Frank. Small thing – typo – should be “discalced”, not “discaled” Carmelit Order in the second paragraph. Christians around the world need to learn from this woman. Instead of slings and arrows they should be showing love and compassion. They should be emulating the one they worship. Thank you for your work lifting up the plight of trans women and helping to alieviate their suffering and to enable them to live peaceful and secure lives. What a wonderful story, especially the quote from Pope Francis, which I’d never seen before, and which is very heartening to someone like me, on the fringes of the fringes.